Online back to school shopping! //Cheers Marie! - live life and enjoy! Online back to school shopping! //Cheers Marie! By the title of this blog, you know its almost that time of the year!!! Back to school!!! 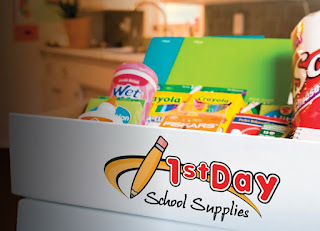 The kids will be back in a few weeks, by this time, as a parent you should be thinking about back to school shopping. Or not. Depends on your schedule. I recommend shopping now before the stores get crazy or if you're like me, just doing online shopping. The back to school online shopping works great for me. My husband and I have a bad experience shopping in stores. looking for specific brand, size and requirements that the teacher needed. When i was i kid, i remember i love back to school shopping since its all for me, new things that i'm excited about. Anyway, i just want to share this website that works great for us. this was recommended by our kids school. not sponsored post, just being a mom sharing mom things! It delivers right to your kid/s school. in a box with all the supplies the school require. This is our second year ordering online and its amazing! We paid $59.99 for all the list below and i think its worth it. Saves you time, money, and gas going to your local stores like target, walmart etc.